We've been here before. Eight times on the spin before today to be precise. And sure enough not even the Interlagos venue's legendary capacity for mischief did anything to upset his confident, preponderant strut. Sebastian Vettel won the Brazilian Grand Prix, and did so in familiar style: seizing control of the race early and never relinquishing it, nor ever looking like doing so. In the end, the only thing that was unexpected was that the anticipated rain didn't arrive - well, not properly anyway. Not that greater quantities likely would have stopped Seb. And as seems to be a race-by-race occurrence at the moment a couple more all-time records went Seb's way today: both Michael Schumacher's mark of 13 wins in a season and Alberto Ascari's record of nine on the bounce - a record before now which always had an untouchable, almost mythical, slant - were matched. It underlines that Seb is on a pedestal right now, and that his rivals have long since been counting down the days to the season end and to the big shifts in regulations for 2014, which send everyone back to base camp, to put them out of their misery. But there are reasons to think those may not scupper Seb much either. 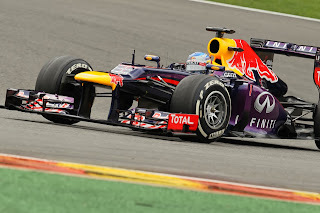 Seb, unusually, lost the lead off the line today, to Nico Rosberg's fast starting Merc. That was as good as it got though for Nico as his machine was clearly ill-handling as well as brick slow in a straight line. Come the start-finish blast through the Boxes section at the end of the opening Seb cruised by, and in his typical style was then gone: 1.4 seconds clear the next time around, five seconds after five laps, ten after 14. Once again, rather rapidly it was all over bar the shouting - or rather, bar the rainstorms. Fernando Alonso and Mark Webber moved past Rosberg in short order too, and thus the identity of the top three was set also. 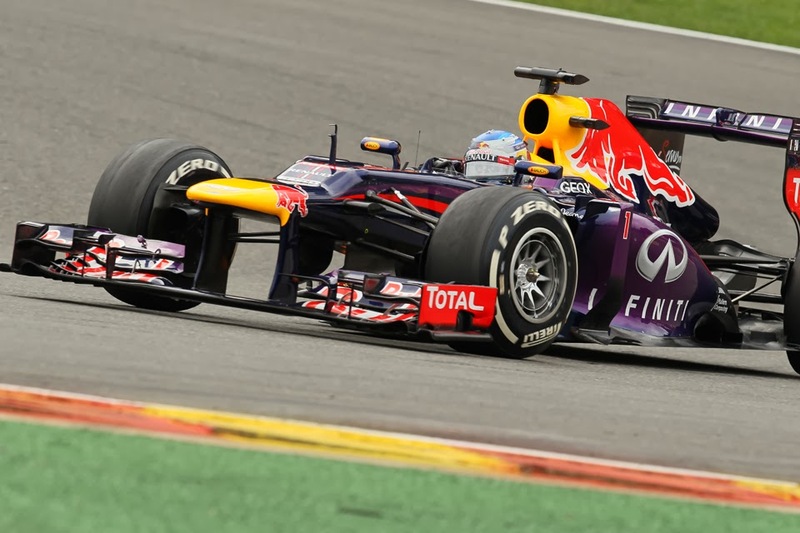 Webber eventually came home second, in a drive wherein although he never quite had the legs to get with Seb was a fitting send-off in his last F1 race prior to decamping to sportscars. There have been next to no signs of relent since Webber announced that this year would be his last at this level, and today he indeed sprinted over the line. He looked typically combative throughout, and made fine passes on Rosberg, Hamilton (especially - around the outside of Ferradura) and twice on Alonso to claim the runner up spot. 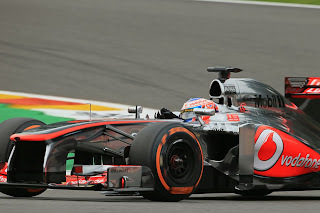 It also ensured him a trip to the FIA Gala as it places him third in the final drivers' table. Alonso was mighty as always too, alone clinging to the Red Bulls and showing no outward appearance of giving up, and third place in the end was his reward. It was a race with a few adventures along the way however. First of all Webber's first pitstop was botched ever so slightly (resulting in a groan of familiarity among those watching on) which put him behind Alonso briefly, though Webber righted this not long afterwards. Then later Lewis Hamilton managed to make contact with Valtteri Bottas, in the unusual situation wherein Bottas on fresher tyres sought to unlap himself. Lewis veered onto his line and there was contact (a little reminiscent of Lewis veering into Kamui Kobayashi in Spa in 2011), which punctured Lewis's tyre and put Bottas out. This had a knock-on impact, as both Red Bull and Ferrari feared a safety car as a result (which, rather like the precipitation, never came in actuality) and the top three piled into the pits for their final stops. The Red Bull crew wasn't ready for Vettel, and his tardy stop meant that Webber had to queue. It all almost cost Webber his second place for the second time. But only almost. 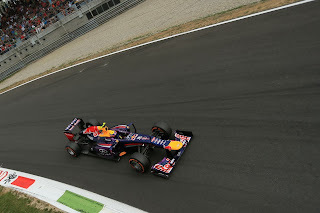 It didn't change the Vettel-Webber-Alonso order but it did close them up. But such were the marginal differences in the pace of each - Vettel a bit quicker than Webber, who was a bit quicker than Alonso - order changes were never on. And indeed they filled the podium places in the same order. Other adventures included that Felipe Massa and Lewis Hamilton both picked up drive through penalties. For Lewis it was for the Bottas contact (pretty much standard these days for causing a collision). In Massa's case there was more wrangling in response, as he was penalised for crossing the hatched area of the pit entry, apparently repeatedly. For all of the seething - not least from Massa himself - at it all, to be blunt I didn't have much sympathy. All drivers had been warned not to put all four wheels onto the hatched area earlier in the weekend, while reportedly Massa had been warned for doing it prior to his final strike. In that situation to do it again really gives no excuse. 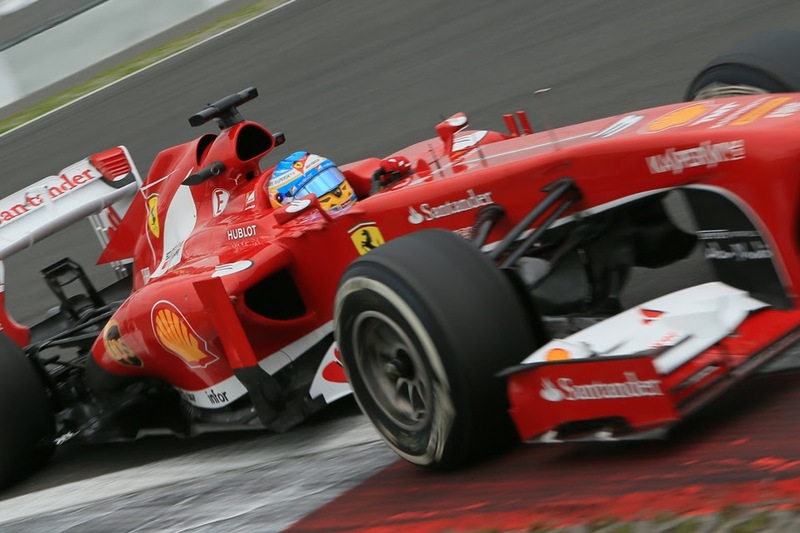 Ferrari had particular cause for regret, as the probable three-four it scuppered would have been enough for second place in the constructors' standings. As it was Mercedes clung onto it by its fingernails after a difficult day. As has been the case in the second half of the 2013 season though today felt a lot like freewheeling; continuing the momentum that was in place previously. And Sebastian Vettel was freewheeling more than most. His latest victory was effectively known at the end of lap one. In the absence of the expected rain, it was certain.